Let’s talk about the ceiling truss advantage that a lot of people have. We get a lot of calls and room forms where people are redoing a basement. Basements are really a problem because we have low ceiling heights. But we have a lot of advantage in a lot of homes where we have a series of trusses or support systems built into the first floor which is the ceiling of the basement. So we know that usually when we do our dimensions in acoustics we have width, height and length, we always try to get two of the three favorable. And it’s usually the height dimension, that’s the biggest problem because that’s the lowest. What’s some ideal lengths and widths? We try to stay 14 feet and above greater so you never get that in a ceiling height so it’s always a compromise. So with the height of the room being the smallest dimension it creates the greatest amount of problems and the ceiling of course runs the full length of the room so the pressure problems are throughout the whole room, we’re just not isolating them to one part. So if we have a truss system and this is the floor, first floor and we have these trusses and they’re usually 8, 10, 12 inches deep here so we have a nice cavity to work with. And we can simply create a diaphragmatic absorber here and we use our carbon technology here. And by adjusting the depth of the cavity, we can tune the absorber to the frequency response we need for that position in the room. And then we put our face over it and it’s finished. So we have a nice diaphragmatic absorber with the floor as the back of the absorber and the trusses two sides and then we finish it off to get our diaphragm on the face. So it’s a nice way if you have a truss system, you really have an advantage going for you in managing the low frequency energy in the room. So we’ve done quite a few of these lately. 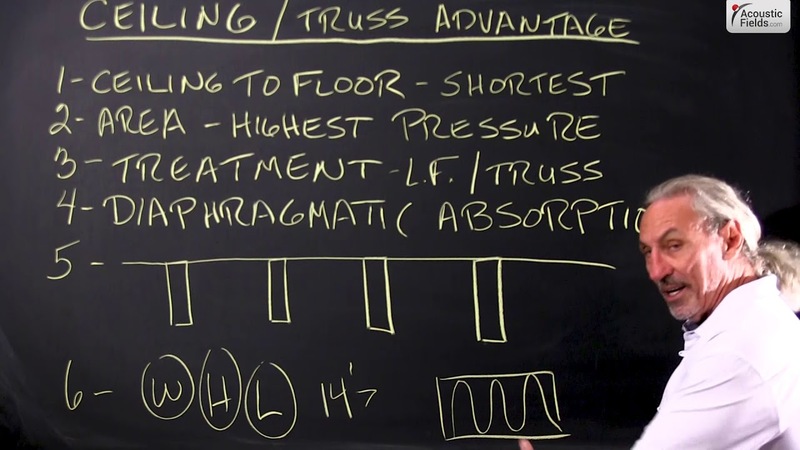 I thought I’d bring it to your attention because if you have this system, and I’m sure you’re not going to have a favorable ceiling height if it’s a basement, we actually have the horsepower with the truss system to manage it. Thank you.